The Rancho Mirage home of a Los Angeles couple is actually the collaborative work of three Legorreta disciples. The Owner’s nephew had built a Legorreta home in Los Angeles over fifteen years ago. Wanting a similar design for their new property on a golf course, they contacted Bill Bernstein who was the project architect on the previous house for the nephew. After discussing the idea with Ricardo Legorreta, it was decided that Bill would work together with Gerardo Alonso, the project architect at Legorreta Arquitectos for the former project, to create an authentic Legorreta style home in a desert setting. 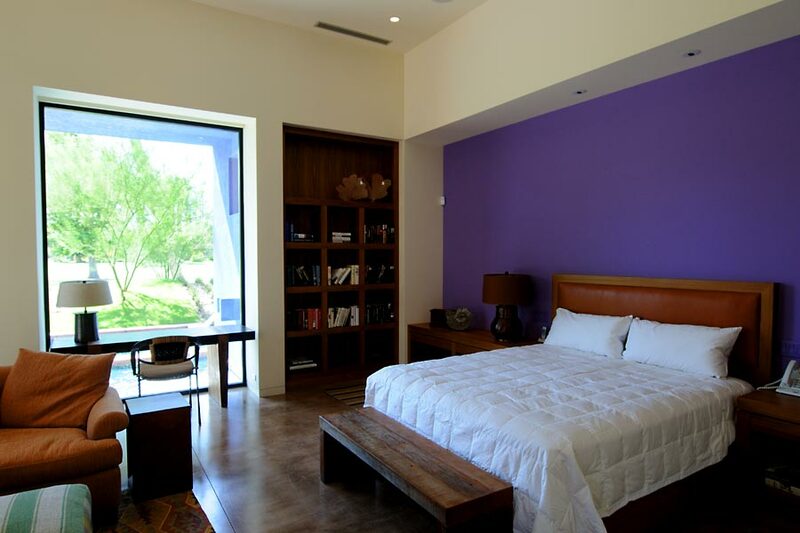 Together with Carlos Zubieta, the three disciples master minded this beautiful vacation home with integral Casitas, an open entry court and glassed in loggia that separates the home into living and personal wings. The western side of the house opens directly onto the golf course with views of the San Jacinto mountains. The southern wing contains a large great room with kitchen and dining open to the pool terrace and golf course views. An outdoor trellis in classic Legorreta style, not only provides shade to the great room and a covered eating area, but overhangs a portion of the pool providing relief from the stifling desert sun. 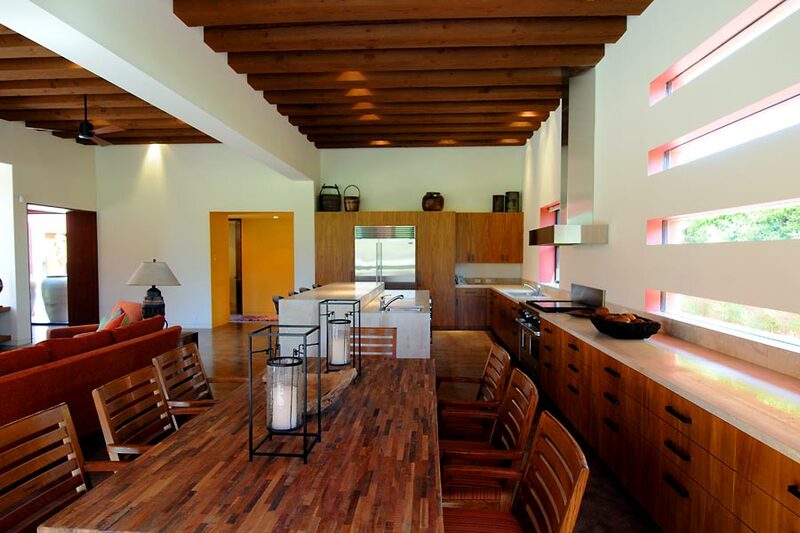 Casitas 1, a laundry room and a garage dedicated for golf carts completes this wing of the house. Crossing the vibrant red plastered loggia, which interrupts the two courtyards dividing the building, you enter into a soft Jacaranda color vestibule that leads to the master suite or the gym. The master bedroom anchors the western end of the northern wing with doors to the pool terrace as well as a grand, full height picture window, framing a classic wall spout fountain and the spa at the end of the pool. Skylights adorn a large double shower in the master bath and separates the room into his and hers compartments. A gym and Casitas 2 lead down to the main garage. 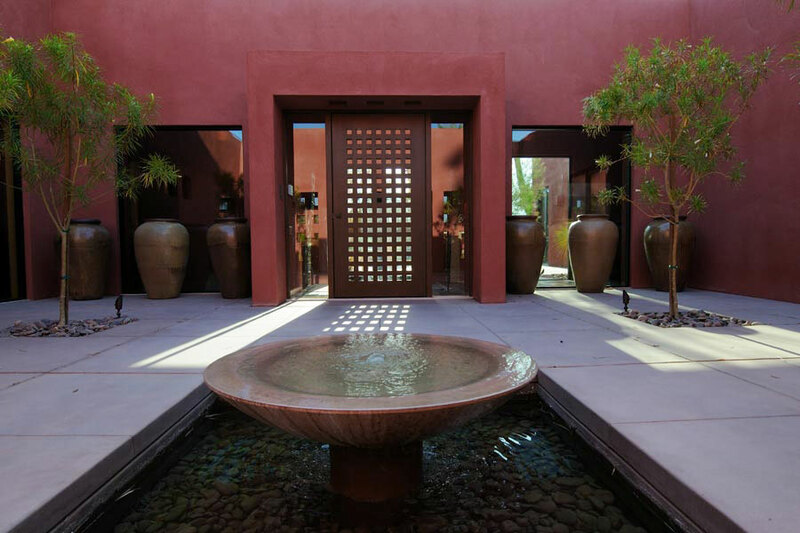 The detailing and materials, which include large wood beams, vibrant colored plaster, polished concrete floors and steel gates, make this the next best thing to Legorreta, and a perfect oasis in the desert.